Eden Festival have unveiled their headline performers to celebrate the 10th anniversary of their eclectic festival. Eden Festival takes place at Raehill Meadows in Dumfries and Galloway on June 7 -10th with twelve stages and over 300 performers. It is Scotlands largest not for profit community run festival, attracting thousands of festival goers from out with the country. Festival Director, Meredith Langley Vine said, “This year is our 10th anniversary and it’s going to be a really special one, we’re excited to be inviting back some of the best acts that have played over the last decade”. Tickets are limited for the 2018 festival and is expected to sell out due to its growing popularity. 10,000 attendees are anticipated to visit the stunning venue near Moffat. Tier two tickets are now available priced at £110 for an adult, £74 for a teenager, £20 for children between the ages of 5-12 years old, and under 5’s get in for free (all children must be accompanied by an adult). 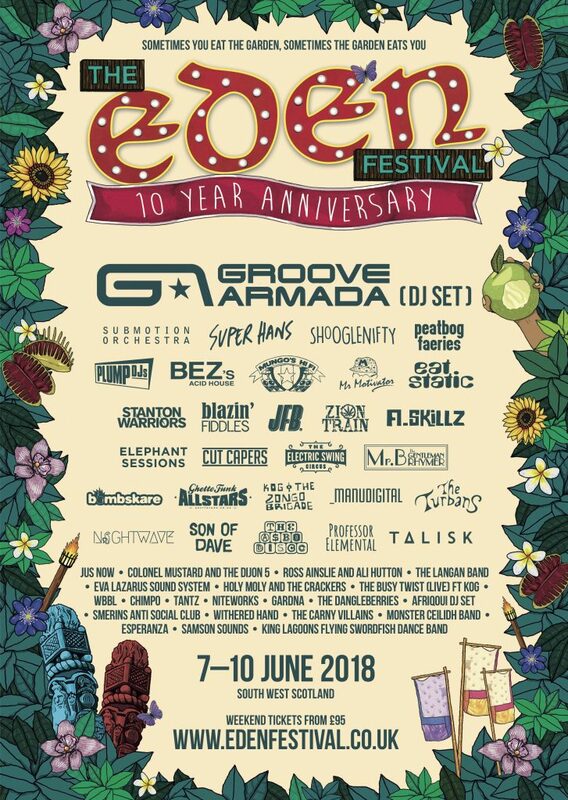 This year you can also purchase Eden Festival tickets in installments via their payment plan, please visit their website for more information www.edenfestival.co.uk.